Your ability to communicate information, ideas and opinions in spoken English is tested in Paper 5. You are tested in a pair with another candidate. The paper contains four parts. (In Unit 13 Lesson 4 you will also be able to study Parts 3 and 4 and practise a whole paper). The examiner will ask each of you some introductory questions about yourself (e.g. about your family, home, hobbies and interests, plans for the future). Each of you will have to speak directly to the examiner. Part 1 lasts for about 4 minutes. For your better practice, prepare a list of questions for finding out personal information from someone you have just met. With a friend or relative, try to practise asking and answering these questions. The examiner will ask each of you in turn to talk for one minute about a pair of photos. Each of you will be given a different pair of photos. You will have to compare and contrast your photos and relate them to your own experience. Listen carefully to the examiner's instructions. In your minute of talking time, focus on the points the examiner has indicated. When you have finished, the other candidate will have to make a brief comment about what you have said. Part 2 lasts for about 3 minutes. 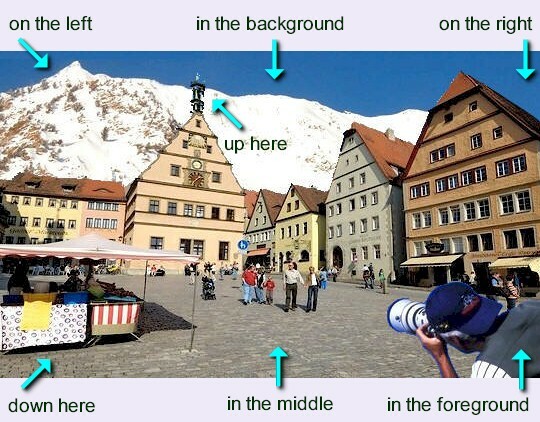 the sentence structure THERE IS/ARE practised in Lesson 15, Page 4.
the Present Progressive tense with the appropriate phrase from around Photo 1 or 2. In the background there are mountains towering over the scene. A boy in a blue cap is taking a picture. He looks like a professional photographer. People walking by seem impressed. They could be waiting for some more friends. It looks as if they are having an interesting visit. Compare and contrast the people, the places and the activities in each pair of photos. Explain which of these places you would prefer to go to, and which of these activities you would prefer to do. Say if you have ever been in any similar places in your country. Now repeat steps 2-3, trying to speak without stopping and fitting all your ideas into one minute of talking time. Entretenida forma de aprender a describir fotos, no?